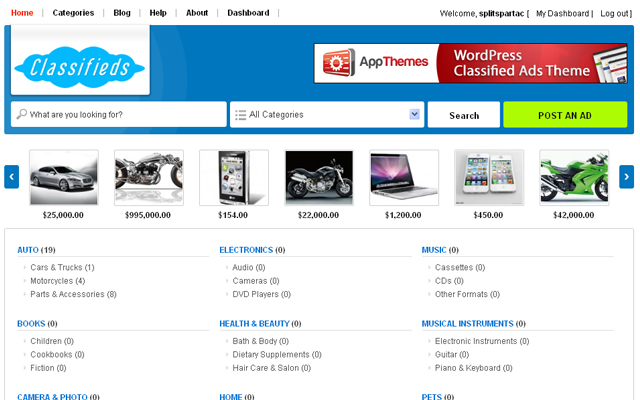 Ultra Classifieds is the most highly premium and most advanced ClassiPress child theme. It is very flexible, with a clean & crisp design and is suitable for any classified ads niches. It features an advanced theme options which will make your life a lot easier when creating, managing and controlling all the functions of your site. 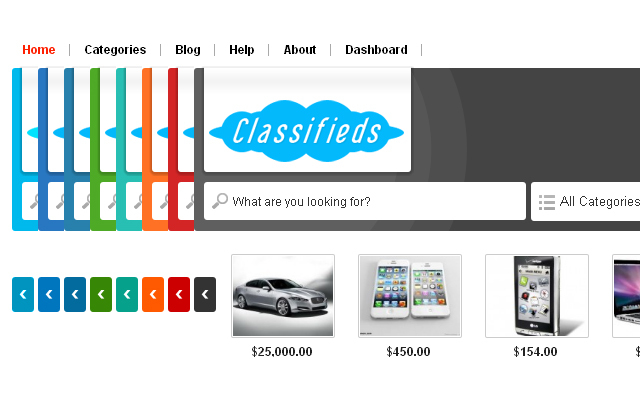 Ultra Classifieds provides you with every module you might need to have on a professional classified web site. Each module comes bundled with its own options and features. 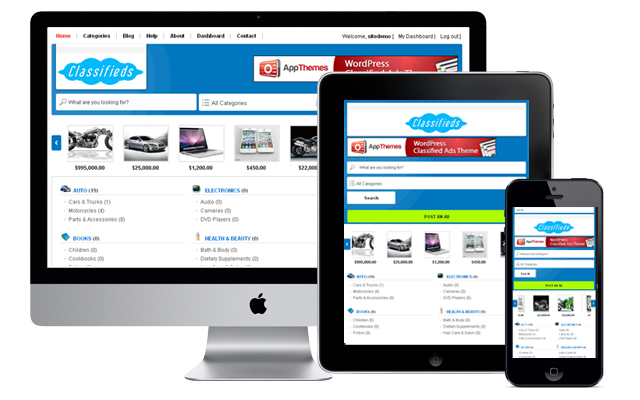 Responsive design: The theme is completely responsive and optimized for mobile devices. Tested on all major devices (iPhone, iPad, Android). To test it please resize your browser. 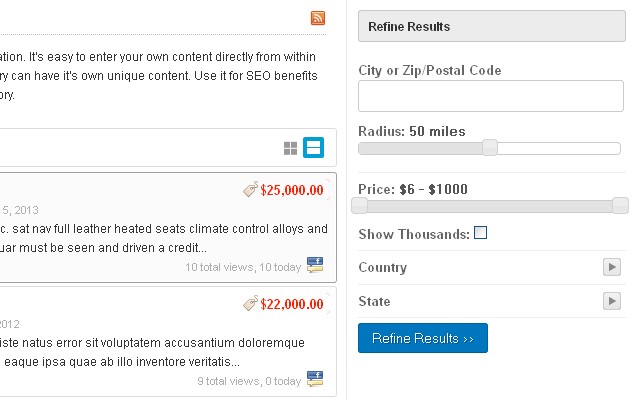 Grid/List mode: Yep, Ultra Classifieds is packed with grid/list view, Yet, you still can enable/disable it in the admin. 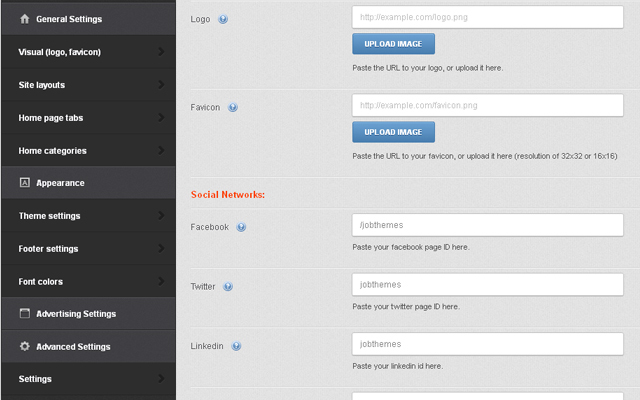 By default it’s enabled for a fancy and impact look and feel.There is an option in the admin to set the default mode. 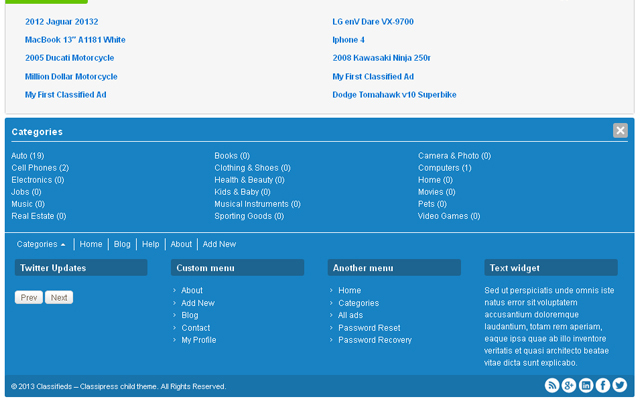 Home page layouts: We have created two layouts for the home page. They can be used according to your taste and the site’s purpose, either you want the home page to be simple like the classified ads search engines such as vivastreet.com, leboncoin.fr etc , or to be modern , that displays the tabs and sidebars…! You control how your want the home page should be. 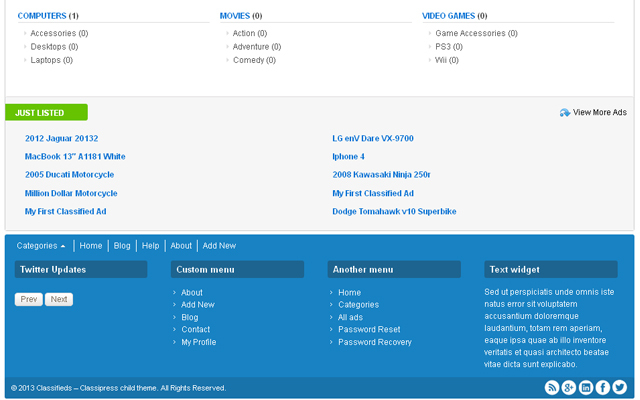 Categories’ icons: This is one more fancy feature, Through the admin panel , You can add icons/images to each parent category of the ad listings, No need to edit any code, Just select the category, then upload its icon to be displayed besides the title of the categories in the home page. 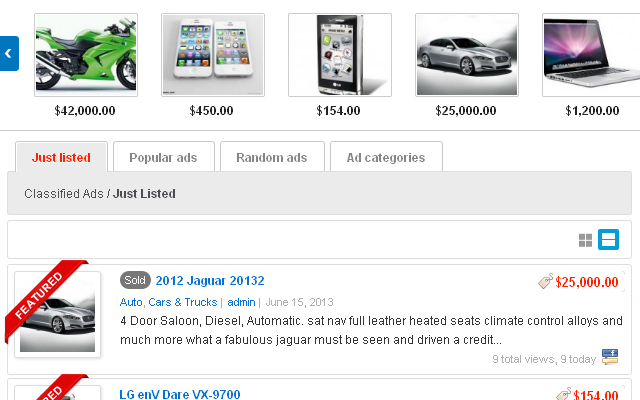 The related ads: Ultra Classifieds was implemented to be unique and it could not be so without a built-in function that displays the related ads in the bottom area of each ad. You control how many ads to be displayed, the title of this section and whenever you want, You can enable or disable the related ads. Advertising module: Comes out of the box, Ultra Classifieds is packaged with an intuitive ad manager, that helps you to start making money with your website. 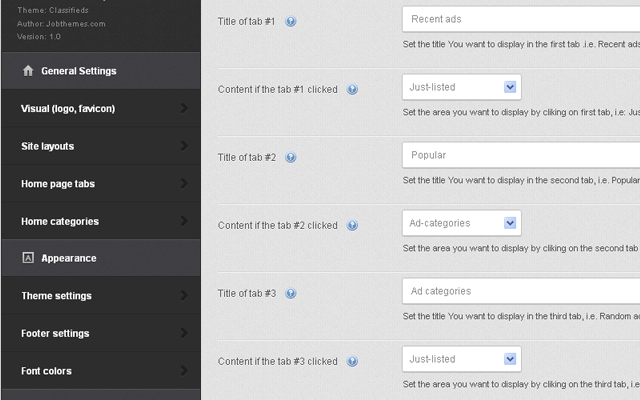 It’s super easy to manage the advertisements in special areas of your site. Limitless Color Customization: Ultra Classifieds allows you to change colors and view the changes on the fly by allowing quick and accurate skinning to match your brand identity. Whether you want to create a dark/light/colorful/clean/minimal site, Ultra Classifieds offers the ability to match any style with ease. All this in addition of 8 predefined color schemes. Revolution slider [NEW]: The most advanced responsive slider with powerful options panel is now included in Ultraclassifieds with a one click install. Localised For Translations: Ultra Classifieds uses the same language package of classipress, hence just install it and all the content be translated into your own language. Cross Browser Compatible: We’ve tested our themes to ensure they are compatible with all the modern web browsers like Firefox, Safari, Chrome and Internet Explorer. Monetize your site easily by inserting ad spots into the home page, between ad listings, on top of the ad details, bellow the description in the ad page, in the head and in the footer. 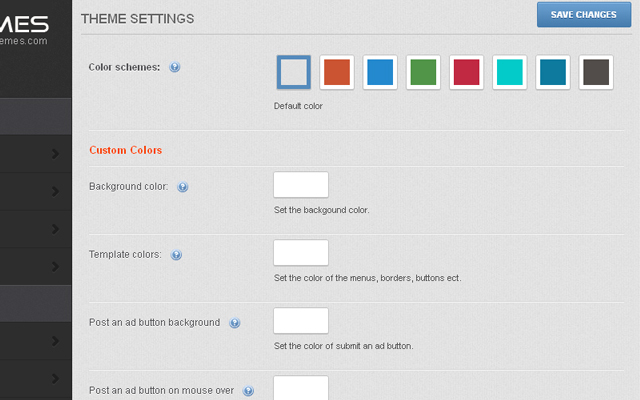 Custom colors: Set the color of the site, the buttons, the main border, the font, the menu items. Footer custom colors: Set the background color for the footer, Upload the background image to use in the footer area. 1 Footer area, 2 or 3 or 4, You set how many columns you want for your footer. 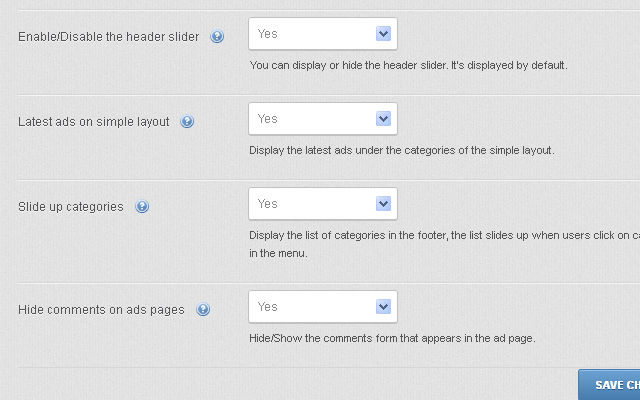 More options included, You can find it our yourself by browsing the theme options panel in the admin demo. So grab Ultra Classifieds today and enjoy the experience of owning professional classified ads’ web sites. All our customers get the fastest reliable support available around. You can give it a try to see the rate of our responses’ pace. Your Ultra ِClassifieds now is installed and ready for use. Important: In order use some features, You need to enable the jquery, to do it, go to Classipress => Advanced settings => Enable ” Use Google CDN jQuery “, Save settings. – Do not forget to backup your site before you install Ultra ِClassifieds. No support from past 3 weeks. 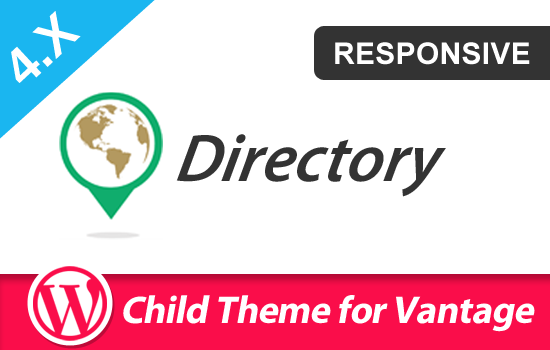 This is the best looking child theme in the marketplace with l lots options to custimze its looks but since 85% or more of traffic in North America is mobile, shouldn’t every theme show the featured ads and other options on mobile devices without any extra plugins or coding? The website users that pay for a futered ad want their money back because the ad is not shown to the mobile users, so there is no point on paying for it. Larger featured slider images, retained on mobiles devices. Option to show a clickable Contact Number to the contact form. There is one theme with these options and more, it is just not pretty looking one but is perfect, ultra classified developer team should work in these features and make them available in their next update. UltraClassifieds is a great and wonderful theme that I have seen so far. It has lot of cool features that make the look and feel of your site professional. I like how simple and user friendly the theme is. Many thanks to the team for a job well done and I know for sure we are yet to see more great things happening. For this I rate this team excellent. I really like Ultra Classifieds. The theme comes with very nice features. The PHP Code is very clean and well structured too. [ spartac ] helped me to enhance the theme. The support is very fast. Thanks too much. the code must work, I will make sure it does. I have double checked your provided codes. It is the same, still align to the left. my bad may bad !!! here is the correct one .. Sorrryyyy ! Thanks a lot, I works perfectly with 130px. 1. Installed ultra classified child theme on my site and getting below error in ad listing page under “Related ads”. 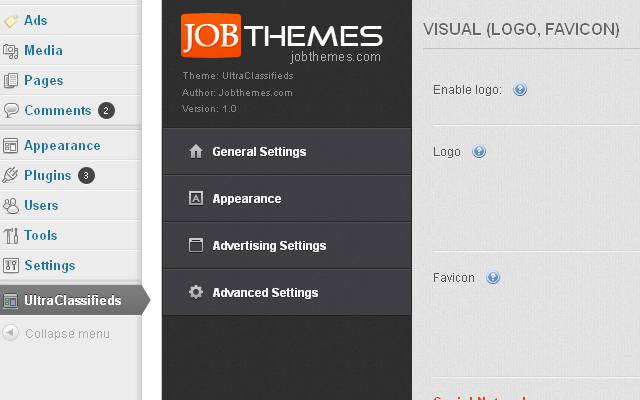 Note: send a mail to support@jobthemes.com for the same but still no response. in case you sent the url and the admin access by email. I am going to fix it on your website. there is only one like to remove from the related ads file.the same like producing that error. Provide me steps to do that. i will do it by my own..
and also in home page Scroll ad option is not working…. I would like to disable that in my home page. 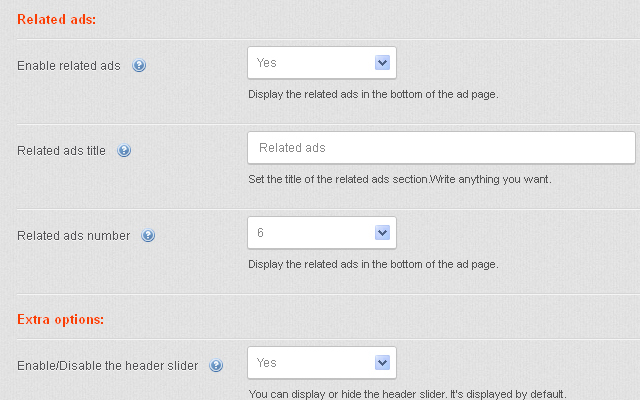 tell me steps to disable scroll ads option in home page also. I am wondering after 7 days also no reply and update from you. This is how will i get support from you for paid theme? at any case, the theme shouldnt stop wrking properly UNLESS there is a third party plugin or a file that’s interrupting the work of the theme. try to deactivate all the plugins, especially the cache ones that you must delete them , beause even deactivated, they will still save data there. 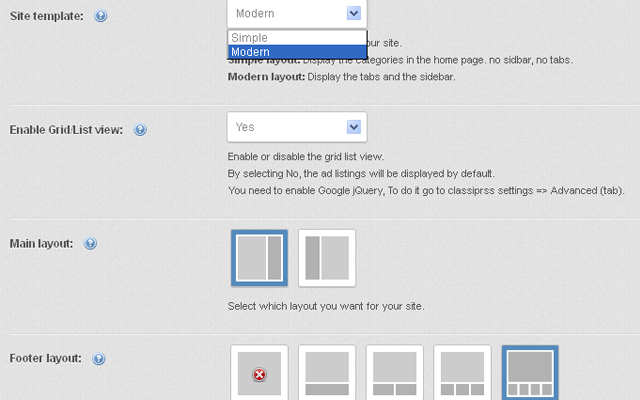 then go to appearance => customize => disable the js drop jQuery options. anad save again. If you provide an url , I can take a look and help you better. I have shared details one week before, After a week also no response and support. Waste of money to buy this product. Hi ramswebsolution.. where did you send your emails or shared the data? did you send ftp or wp admin codes? Your issues can be fixed in 5 seconds but we need the access to either ftp or admin access!. 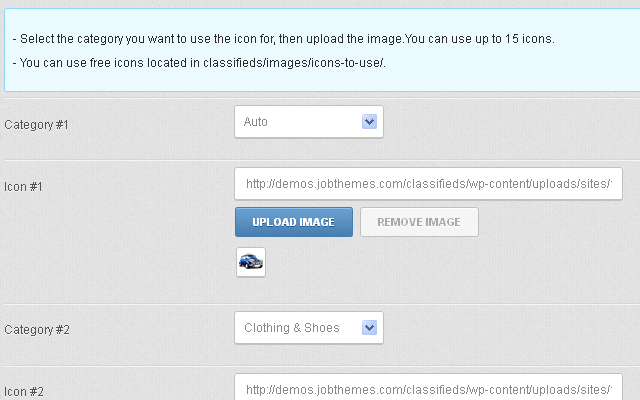 Details emailed to you support@jobthemes.com, please fix the issue or provide us a steps to fix it. Hi ram, Thanks for your message and email, I am going to look at it immediately. @ramswebsolution.. I havent received it on support@jobthemes.com .. I jave sent an email to yours ram****@gmail.com , check it out, if you receive it, reply to it . Sent you emails for days and no reply at all. Classpress works perfectly fine on my site. ive read thru all your installation guide. there is error 500 when i get the responsive slider installed, and i couldnt even go back to my admin page. ive Spent $347 dollars in a single purchase, and i did not see any “vip” support add on to buy. i love your child theme. i’m prepared to pay for further possible customisation with you. currently ive purchased many plugins, and it’s having conflict with each other. 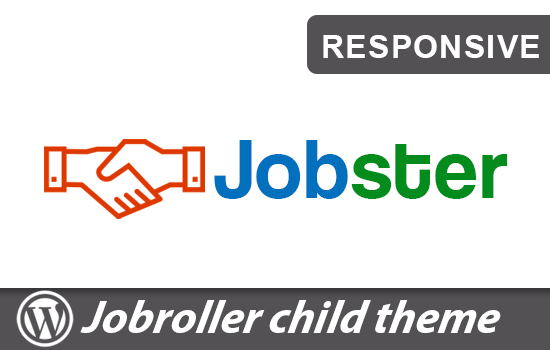 This child theme is made by me (spartac) not appthemes, for this they redirected you to use our support channels which is by email to support @ jobthemes.com . Our theme costs only $39, the vip club that you purchased from appthemes doesn’t include our child theme or any of the marketplace items. Please send url + admin access by email so I can see what’s going on with your website and fix it. Once again, we only provide official support for Ultraclassifieds theme, not classipress or any of appthemes vip club items. (we will still friendly provide help with what we can if they are related to appthemes products. Tried to install ultra-classifieds and got this feedback – The parent theme could not be found. How do I go about solving it? I have replied your private message. please send url + admin access by email to support @ jobthemes.com, something must be wrong unless, everything is working properly.